Neat project! I’m interested in the claim that “this circuit will provide excellent performance comparable to commercial detectors or better.” How does one calibrate a radiation measuring instrument? That’s the problem I always struggle with when it comes to integrating a new sensor generally. Unrelated to calibration, In my limited experience looking at radiation, it seems like sourcing Geiger-Muller tubes is also kind of a crap shoot… are there reliable sources out there? Pointers? These metal tubes aren’t as sensitive as the expensive and fragile pancake style tubes. Calibrate? I’m sure that in 2017, plutonium is available in every corner drugstore. Just Vandalise a Russian Lighthouse those are powered with an RTG, 2 geniuses in search of scrap metal found the bright way out on this one and threw the Strontium into the water after stealing all the Stainless and dying in such a fun way. The irony is in this day and age that for about $80+shipping you can get a calibrated radiation source sent to your home, or if you are on some sort of list and need someone less picky you can just go to Amazon.com, no really. Let us know if you tape yourself to a ceiling or decide to build a Plasma Gap speaker. They are tested using harmless radiation sources (you can buy them on ebay), As for the calibration, I’ll let Radu answer.. I know he characterizes each unit sold, and embed the values in the firmware (I own a model A since Dec 2014). Typically they are calibrated off a NIST traceable cobalt 60 source. Otherwise it is pretty useless as a dosimeter. You calibrate them by measuring a source of known intensity at a fixed distance, from which you can calculate the intrinsic efficiency of the tube (how many counts it registers per radiation particle entering the detector, always less than 1). For more sensitive detectors you need several known test sources of different types, but GM detectors are pretty crap anyway so you only really need one. You can buy the sources from a lab, but they’re kinda pricey. Or you could use something off of Ebay, again GM tubes aren’t very sensitive anyway so it doesn’t matter much. You cannot perform callibration at home but there is conversion coefficient available for the used tube (SBM-20) to recalculate number of pulses per second (or per minute) to dose rate in microSv/h for example. But it is definitely not device for precise measurements. You can also test the detector functionality in high radiation levels with signal generator used to work as a fake GM tube and provide appropriate high number of pulses in the circuit. The kit form is excellently presented. The choice of Ethernet instead of WiFi seems odd now that we have so many “Internet of crappy Things” being made now but it has Power Over Ethernet so that may be a bonus for some. As far as I know, most boundary routers/modems don’t support POE. You can buy dirt cheap POE injectors (which are not standards abiding, but it works flawlessly in this case). As for why go for Ethernet : Reliability, price at the moment of conception, the projects is older than the Internet Of S#!T$ trend (<2014). The latest models (A3 and D) have WiFi. Ufortunately, there are no cheap (I mean really cheap), easy sourceable and ready-to-use Ethernet+MCU solutions like ESP8266 for WiFi. There are a lot of cheap mini routers that run OpenWRT. Just disable the Wifi if you don’t need it. that’s just because the boards are red. There is an error in the picture. 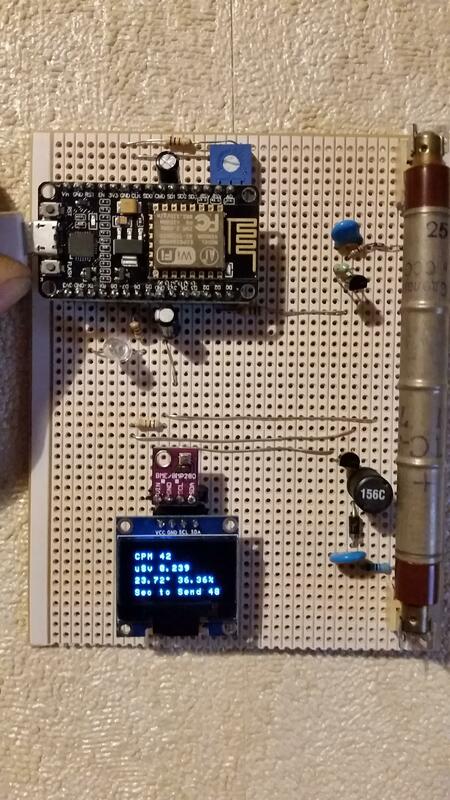 I have built an ESP8266 kit too, the GK-Radmon by BroHogan. The SBM-20 (or STS-5) appears to still be quite expensive. Ranging from 15USD to 36USD in small quantities. This is def cheaper that $60 for some of the other tubes but wondering if a cheaper mechanism. Also SBM-20 does not appear to detect alpha particles (only beta and gamma) which is obviously good but what about Alphas ? Alpha detectors are really expensive and sensitive to be used in DIY projects. Similar with spectrometers. If you know cheaper geiger tubes than SBM-20, with the same or better sensibility, let me know.